Dr. Aldo will help you achieve your desired breast implant size. Beauty in all shapes and sizes, actual patients. Breast implants are our specialty. Breast implants today can be round, high profile, ultra high profile, medium profile, low profile, elliptical, anatomic, and tear-drop shape. The breast implant size range begins as low as 120 milliliters and goes up to 800 milliliters. The average breast implant size used at Guerra Plastic Surgery Center is about 350 - 450 milliliters, but this varies from year to year. The outer shells come in two varieties, smooth and textured but smooth is the most common. Dr. Aldo will help you find the right size for you at your consultation. All of these different possibilities must be taken into consideration and it takes considerable experience to make the proper choice for each individual patient. Dr. Aldo Guerra specializes in breast implant placement in Arizona and he will help you choose the right implants for you at your breast augmentation consultation. Before and after 375cc MM+ MemoryShape® Breast Implants, Actual Patient. Before and after 340cc High Profile Saline Breast Implants, Actual Patient. Actual Patient, Breast Augmentation with Dr. Aldo Guerra. Our patients get to try different volume of cup sizes at their consutlation with the Mentor® Volume Siziing System. Try different sizes at your consultation. Choosing the right breast implant size is generally the most important decision a woman and her surgeon will make. Dr. Aldo Guerra, a noted Arizona plastic surgeon, will evaluate your existing breast tissue to determine if you have enough tissue to accommodate the desired size of breast implant. Being realistic and following your breast augmentation surgeon's recommendations is very essential for the best result possible. What are the possible physical repercussions of breast implants that are "too big" for me? With breast implants that are too large for the amount of breast tissue you have, the implants' edges may be visible through your skin after your operation or the breast implant may be more easily felt. You may also increase the risk of having surgical complications. Also, breast implants that are excessive in size may increase the effects of gravity on your body, which may cause your breasts to prematurely droop or sag. How much forward projection do you want? Filled with highly cohesive gel that provides durable shape retention, MemoryShape® breast implants provide patients with a balance of shape and feel. This implant will give you the most natural look. It has a "Teardrop" shape and made with the state-of-the art cohesive silicone gel referred to as "Gummy Bear" breast implants. MemoryShape® breast implants available in 5 different shapes and in the latest clinical trials it has demonstrated the lowest complication rate of any breast implant in the industry. Contact us today to see if you are a candidate for MemoryShape® breast implants. 375cc MM+ MemoryShape® Breast Implants. The most popular breast implant profiles. Round silicone MemoryGel® breast implants are available in Moderate Plus Profile, High Profile and Ultra High Profile - each offering a different level of projection (profile) for each breast implants patient's preference and body type. New in 2017 are the MemoryGel® Xtra profiles: Moderate Plus Xtra and High Xtra. These new profiles have more fullness and projection than the standard profiles. View before and after breast implant photos for both breast augmentation and breast lift procedures. It's great for women to have all these options. 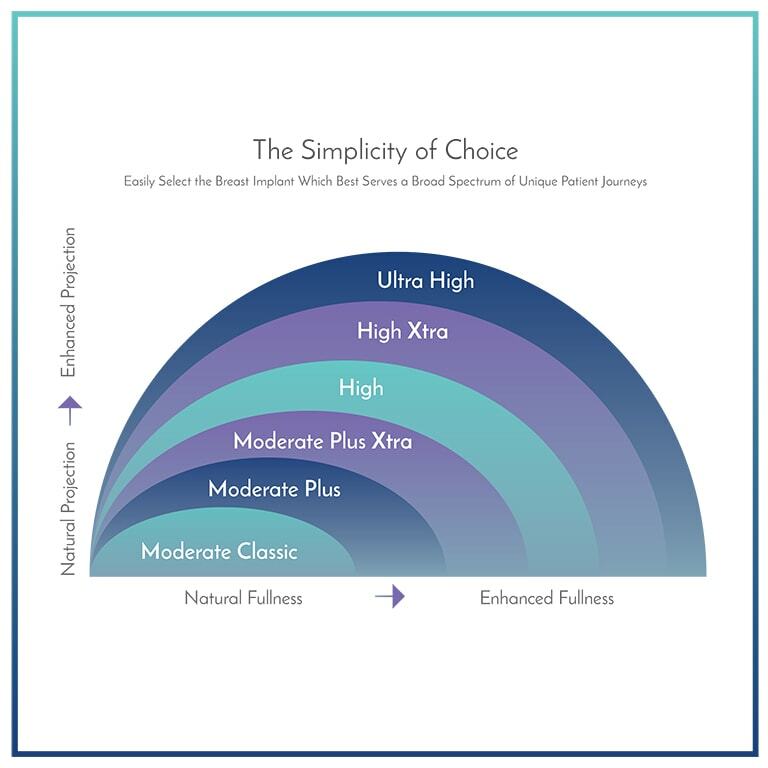 Round saline breast implants are available in Moderate Plus Profile and High Profile - each offering a different level of projection (profile) for each breast implants patient's preference and body type. Round breast implant shapes are available in a wide array of sizes to accomodate various body types. They also come in a High Profile style for greater projection in the breast profile. Round breast implant shells come in two textures. Smooth or Siltex® is a textured surface breast implant, and preferred by some physicians. Smooth surface breast implants may be less likely to be felt through the skin and tissue. Before and after 510cc High Profile saline breast implants, actual patient. Before and after 385cc Mod+ Profile saline breast implants, actual patient. Smooth and textured breast implants. Women today have more options than ever. Breast implant shells come in either a smooth or textured surface. And here is the difference. As a natural reaction to any device placed in the body, scar tissue will form around the breast implant surface, creating a capsule. In some women, the capsule can tighten and squeeze the implant. This occurrence is called capsular contracture. Textured breast implants were designed to reduce the chance of capsular contracture. Some information in the literature on small numbers of patients suggests that surface texturing reduces the chance of severe capsular contracture, but clinical information from studies of a large number of women with Mentor® breast implants shows no difference in the likelihood of developing capsular contracture with textured implants compared to smooth-surfaced implants. Dr. Aldo Guerra provides many solutions for plastic surgery patients seeking to enhance the shape and size of their breasts. He uses the highest quality breast implants to create the look and feel that his breast augmentation patients desire. Make an appointment today with Dr. Aldo Guerra to learn more details about the latest breast implants. Schedule your breast implant consultation today! Want the latest breast implants in Arizona?